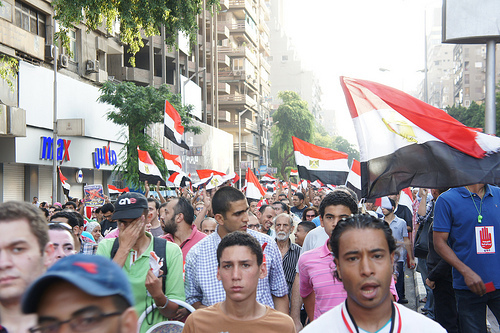 Millions of Egyptians gather in the streets to call for an end to Muslim Brotherhood rule. Anti-Morsi protesters gather in Egypt's Tahrir Square. Photo: Zeinab Mohamed via Flickr. At 4pm, we stepped out in front of the Ministry of Culture in Zamalek. Thousands of Egypt’s artists, intellectuals, and writers were present, along with the biggest cinema and theatre stars. Beside them were studio artists, journalists, academics, students, workers, and many of the residents of Zamalek. The street we were on bears the name of the empress “Shagaret El Dor, who died after being beaten with wooden clogs. But on this day, ladies and young women clapped their wooden clogs against one another, beating time to the tune of “Leave. Leave.” Their musical notes rose with the anger of refusing this regime from the middle ages. Egypt was the future of civilization around me. Young women with their bright faces exposed, Muslims and Copts, modern youth with no room for Jalabeyahs or beards or faces hidden behind black cloths. At around 7pm we reached Opera Square and the Kasr el Nil bridge that leads to Tahrir square. We stopped there because there was no more room for anyone else. My eyes could not take in all the people. When I looked in the opposite direction, by the Galaa bridge, I saw other marches coming in, one after the other, from Dokki, Bolak, Al Harm, Faysal, and Giza. God Almighty! The people were crowding next to each other on the west bank of the Nile by Galaa Square all the way over to my spot on the Kasr El Nil bridge. There, in Tahrir Square, millions had arrived before us. I have never in my life seen crowds like these, even on January 28th, 2011. This has never happened in the history of Egypt, or any other nation in the world. On June 30th, millions of people marched. Some say there were thirty-three million Egyptians, some say less, but one thing is certain: On that day, Egyptians refused religious dominance, extremism, terrorism, violence, and a return to the middle-ages. However, it appears that the widespread terrorism will not surrender without shedding the blood of innocents.